According to the U.S. Bureau of Labor Statistics, there were 611,000 non-farm jobs added in the fourth quarter of 2017, compared to 364,000 jobs in the third quarter. 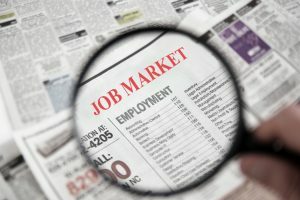 The unemployment rate was just 4.1 percent throughout the fourth quarter, down 0.6 percentage points over the course of the year. Driving the increase in employment were healthcare, construction and manufacturing. Healthcare added 31,000 jobs, exceeding the 12-month average of 25,000. Ambulatory healthcare services (15,000) and hospitals (12,000) were the most active subsectors. Construction added another 30,000 jobs for a total of 300,000 through the year. December saw 24,000 jobs added in specialty trade contractors, likely due to rebuilding efforts after extensive hurricane damage in Q3 and ongoing wildfire damage in the West. Manufacturing increased employment by 25,000 in December; 21,000 were in durable goods. The sector grew by 196,000 for 2017, an improvement over the net decrease of 16,000 during 2016. Professional and business services added 19,000 in December, down from the monthly average of 44,000. Food service and drinking place employment added 25,000 jobs, in keeping with the average 20,750. Tax changes that came into effect January 1 and other legislation will have significant impacts on Q1 2018..
Large employers will probably not see a large hiring increase. Tax strategies already keep the effective corporate tax rate to about 15 percent. Companies have record profits and cash on hand and early evidence suggests they will return money to shareholders rather than immediately invest in expansion. But current employment growth also is unlikely to drop. About half of all employees work for small businesses, which have faced capital access challenges. Lower tax rates could free up money for expansion and make faster employee growth possible. Although construction saw strong growth last quarter, this quarter could see some slowdown with effects of the polar vortex along many parts of the country. Much will depend on further weather, although continued rebuilding after the hurricanes and fires in western regions could keep demand for help steady. Professional and business services had averaged 44,000 job additions a month through 2017. December’s 19,000 could see a rebound now that the holidays are over. Healthcare is also a wild card because of legislative action. The elimination of the personal mandate for insurance will lower demand and uncertainty about the future might reduce future hiring. The sector added 300,000 jobs in 2017, but that was down from the 379,000 in 2016. Long-term unemployment has remained steady as has the number of people working part time for economic reasons. With legislative struggles over immigration continuing, competition for labor will likely increase. Additionally, 18 states have increased their minimum wage, so wages will continue to rise. However, the rate of increase is still low compared to the 20 years before the global financial collapse, so the ultimate impact on hiring will be moderate.